When you begin to teach the horse to load onto the trailer, the first rule is to completely forget about the trailer. 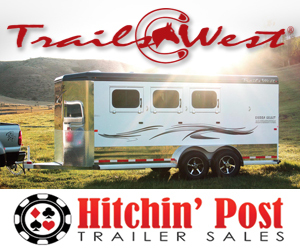 Act like loading the horse onto the trailer is the furthest thing from your mind because the more you think about getting the horse on the trailer, the more you’ll start to act like a predator and scare the horse. 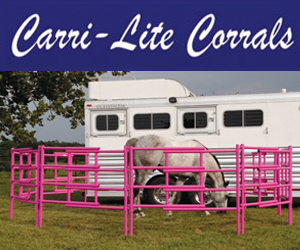 Your first goal is to make sure your horse is comfortable around the trailer. If he’s not comfortable around the trailer, he’s not going to want to get inside of it. Start by asking him to move his feet with energy around all three sides of the trailer. I use the Sending Exercise (making the horse move from one side of my body to the other), but as long as you make your horse hustle his feet, you’ll be in good shape. 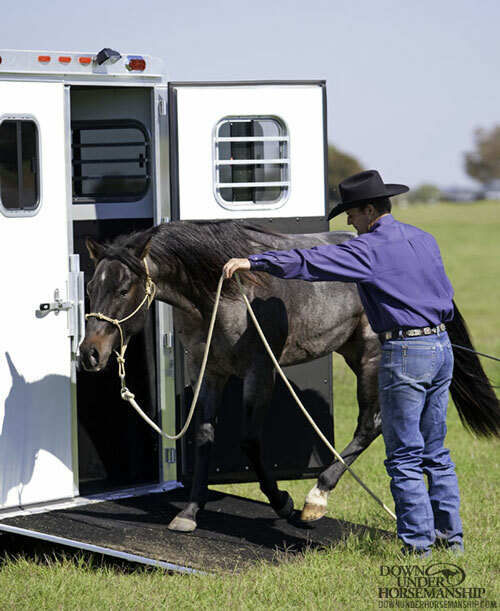 When the horse is comfortable moving around the trailer (he’s not spooking at it), lower the trailer’s ramp and send him back and forth across it. 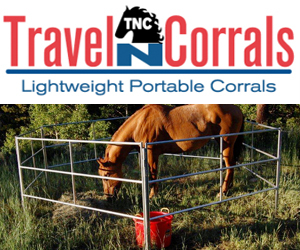 Sending the horse across the ramp will help him get used to the noise the trailer will make when he steps up onto it. Anytime he wants to stop and smell the trailer or paw at the ramp, let him. That’s his way of doing his own safety inspection and proving to himself that the trailer isn’t going to harm him. When he’s calmly walking back and forth across the ramp of the trailer, ask him to take one step inside the trailer. And just before he gets nervous or plants his feet and refuses to move, back him out. You’ll play a little bit of a cat-and-mouse game with the horse so that anytime he gets scared, you’ll back him out of the trailer. That’s the complete opposite of what he expects you to do; he thinks you’re going to try to force him on the trailer. Each time he steps inside of it and you back him out and he doesn’t get hurt, he’ll gain more confidence. When he’s comfortable taking one step inside the trailer, ask him to take two steps, and then back him out again. Keep working on that until his whole body is in the trailer. Then let him rest and relax in the trailer a few minutes as a reward. Next Post:What is Mountain Trail and Trail Challenges?